Prison Architect is now up to it’s 24th alpha version, and one does wonder if it will ever hit beta, or if features will keep being added until it becomes sentient and imprisons us all. Alpha 24 builds on the mod system, allowing architects to create almost anything, from new grants to new jobs; snitches, otherwise known as confidential informants; and remote access systems continue to be expanded. The idea of breaking inmates or exploiting an addiction is obviously really rather awful, but prisons are often fairly awful places. 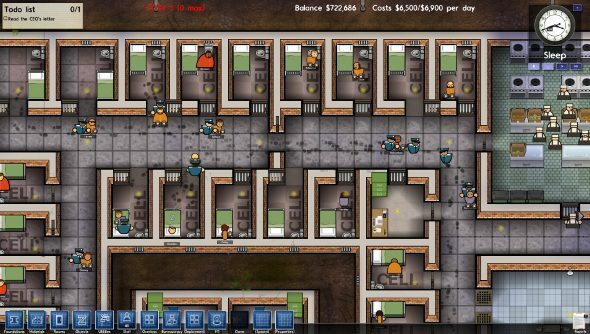 Prisoners are essentially commodities in Prison Architect. They are sources of money, an unwanted product that the prison looks after. And now they are tools. Very unsettling stuff. For a full breakdown of the update, take a gander at Introversion’s detailed walkthrough of the new features below.